The Nau Center for Civil War History continues to make steady progress on its two most important digital projects, Black Virginians in Blue and UVA Unionists. The first is a study of all U.S. Colored Troop soldiers (USCT) born in Albemarle County, Virginia, while the second looks at the almost sixty UVA students and alumni who broke with most of their fellow “Cavaliers” by supporting the Union over the Confederacy during the Civil War. Taken together, both projects will complicate our understanding of local Civil War history at a time when it is increasingly important to remember that that story is much more than just about white southerners who supported the Confederacy. 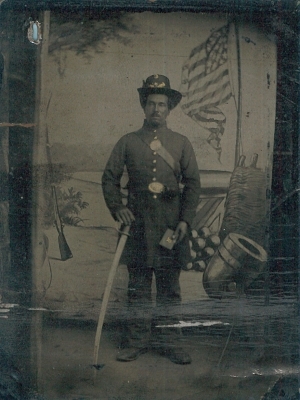 Willis Calhoun, one of the Civil War’s 249 black soldiers or sailors who were born in Albemarle County, Virginia (National Archives). UVA Today recently profiled our work on Albemarle’s USCT soldiers this past fall. If you haven’t read it yet, I encourage you to take a look. It discusses our methods, goals, and progress so far. Having found 249 such men who served in the Union Army or Navy, we still have much work to be done but I am gratified by past and future opportunities to share our work in progress, including at UVA’s October Slavery Symposium and at an upcoming event this Saturday at Appomattox Court House. In particular, this project has benefited from using Civil War pension records to discover, in great detail, information about our soldiers’ and their families’ lives before, during, and after the conflict. We hope to compare our results and findings to those of Donald Schaffer in his brilliant book After the Glory: The Struggles of Black Civil War Veterans (University Press of Kansas, 2004). I believe that pension records can reveal much about Americans who left behind few letters, diaries, or other traces of themselves to present-day historians. I plan on using these pensions in my own studies of immigrants, Catholics, and working-class women in the future. 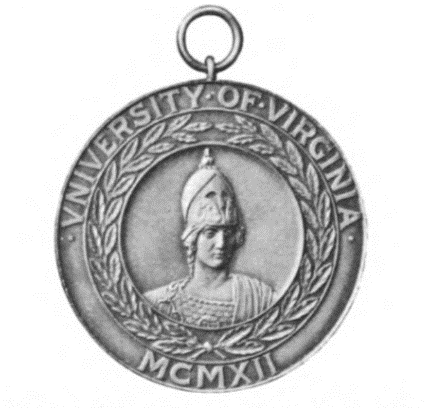 Medal given to UVA’s surviving Confederate alumni in 1912 (UVA Alumni News, July 1912). Union veterans received no such recognition from the university. UVA Today will also release an article about UVA Unionists soon, highlighting in particular the incredible work done by Phd Candidate Brian Neumann who identified most of these Cavaliers in blue. Brian has written a series of posts on our blog about three of these men, while I have added a transcription and short analysis of a 1913 exchange between a local paper and UVA’s Alumni News about the lack of attention paid to the university’s Union soldiers and sailors. Indeed, the year before at the 1912 commencement the university had consciously chosen to commemorate only its Confederate veterans with a banquet and medal-awarding ceremony. Despite being repeatedly snubbed by the university and its chroniclers, many of UVA’s Union veterans led prominent lives. For example, one of UVA’s Union soldiers, Charles Ewing, not only became a general during the war but was also a successful lawyer and leading lay Catholic voice on behalf of Native Americans after the Civil War.